Plans Eastbourne A & B - 2 and 3 Bedrooms, 2 Baths, 1,516 Square Feet of living space with two car garage. Plan Wimbleton C- 3 Bedrooms, 3 Baths, 1,841 Square Feet of living space with three car garage. Plans Brighton A & B - 3 and 4 Bedrooms, 2.5 Baths,1,900 Square Feet of living space with two car garage. Plan Forest Hills - 4 Bedrooms, 3 Baths, 2,068 Square Feet of living space with two car garage. Plans Brighton - 4 and 5 Bedrooms, 2.5 Baths, 2,132 Square Feet of living space with two car garage. Amenities including swimming pools, green parks, swimming pools, tennis court, play grounds for kids and family to play and have fun. Short driving distance to nearby two large shopping centers off of Culver Drive offering restaurants, stores and groceries and many more. The HOA Northwood Courtside Association managed by Namco, Inc. located at 4840 Irvine Boulevard Suite 208 Irvine California 92620. They can be reached at 714-573-0505. HOA dues for this community is very low at $42 per month. 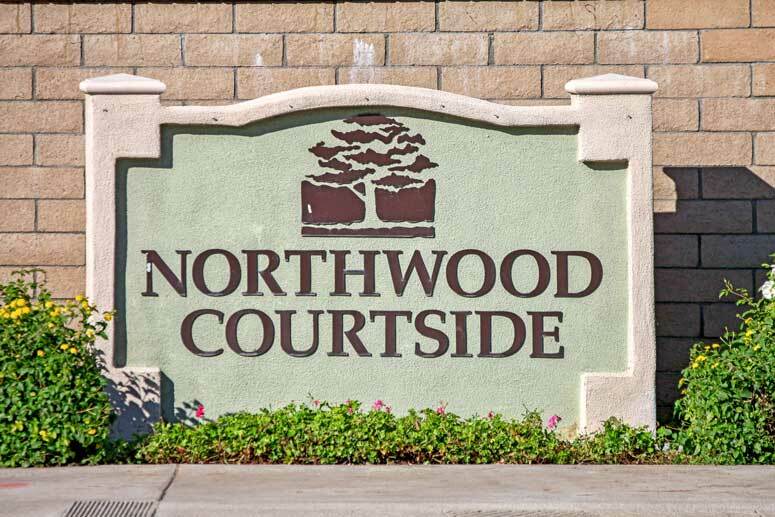 So if interested to buy or lease in Courtside at Northwood communities then, please, have a look around, and contact us with any questions you might have about the market or our services. No question is too mundane - we want to help!